I’m joined today by longtime UW reader John Okray, better known by his nom de post “Johnny O.” I had been wanting to collaborate with Johnny for a long time, and we were supposed to get together last weekend during the U.S. Open, since, aside from Johnny’s passion for everything Milwaukee, he’s also an avid golfer and a club pro. Which means that if I ever do hit the links with him, I’m leaving my wallet at home. Johnny’s also getting married in like a week so I want to offer to him, in advance, my deepest condolences heartfelt congratulations. You da man, Johnny! While he was going to write on John Daly’s lower body stylings, I was going to take you with me on my little sojourn to the U.S. Open. I started playing golf when I was nine years old, I started working at a golf course when I was 15, and now I am an assistant golf pro at Glen Erin Golf Club in Janesville, WI ”¦ so it shouldn’t come as a surprise that I follow the PGA Tour regularly. Something took me by surprise a month or so ago, when I noticed John Daly’s name all over the internet again. And this time it wasn’t because he did something stupid. It was because he was playing half way decent over on the European Tour (He was playing across the pond because he was suspended from the PGA Tour for six months). Something else caught my eye about Big John Daly. It was the way he was dressed. On May 3rd, Daly was wearing some pretty funky pants at the Open de Espana. Kind of strange? Yes. But certainly nothing too out of the ordinary when it comes to the dress of some guys on the Tour. And my personal favorite. What in the world are you wearing Big John? Did you get dressed in the dark? I thought this occurrence might be a one week thing. I was way off. Turns out, the next week at the Italian Open (Daly finished in a tie for 2nd place) Daly wore these outfits: this, this, this, and this. You will notice in that last photo, the belt buckle on Daly looks like an “L” and an “M”. So, I did some digging and found out that John Daly is now being sponsored by a company called Loud Mouth Golf. When perusing the site, you will find that Loud Mouth Golf not only features funky-style golf pants, but they make them in European fit, American fit, big and tall, shorts, belts, hats, and even sport coats. 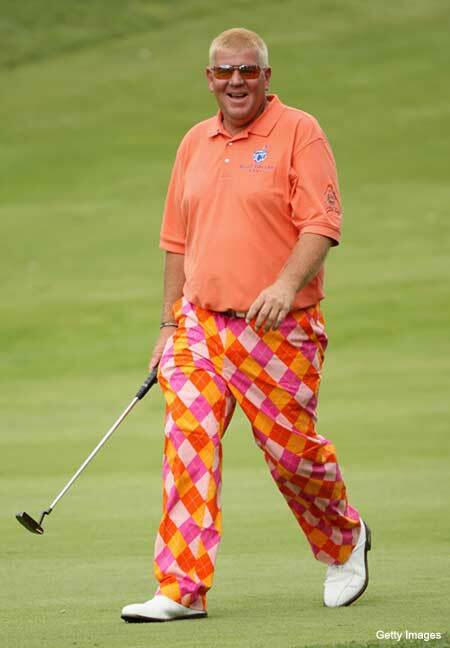 Over the next few weeks on the Euro Tour, Daly dressed up in many combinations from the folks over at Loud Mouth Golf. Some psychedelic examples can be found here, here, here, here, here, here, here, and finally, here. 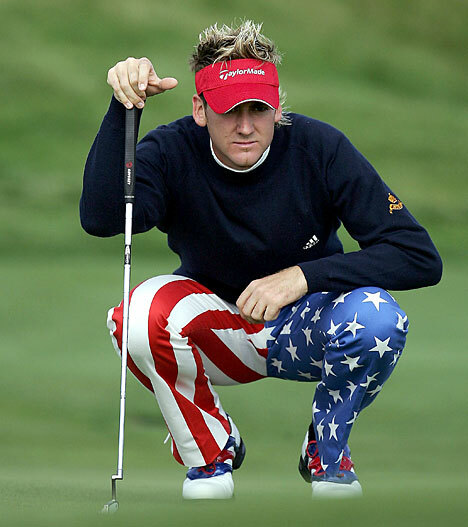 And if that weren’t bad enough, here is what Daly wore to try and qualify for the U.S. Open on June 8th. Coming from a golf pro’s point of view, I think this is a cool thing for Daly to do. He has dropped 40 pounds, and supposedly gotten things together mentally, and with his golf game. He even started a trend a few weeks ago to support awareness when Amy Mickelson was diagnosed with breast cancer. It was Daly’s idea to wear pink for support (not that he invented the idea or anything) and it was the PGA Tour who did the same thing the following Saturday. I think the fashion on the PGA Tour has been kind of bland in the past decade or so. I think it is great that more and more guys are expressing themselves through their clothing. Even Ricky Barnes (who entered the final day of play sitting on top of the U.S. Open Leaderboard) has a cool sense of style. Getting back to John Daly, his six month suspension was lifted last week at the FedEx St. Jude Classic, where Daly played on a sponsor exemption, made the cut, shot +1, and tied for 59th. Daly didn’t let up on color combinations either. I would love to hear other opinions on the new style of Daly. I know it’s kind of off the wall, but I kind of like it. Since Daly’s sponsorship, I have had at least three guys come into the pro shop with Loud Mouth pants on. I always ask if they know that John Daly has been wearing those brand of pants, and they reply, “Oh yeah, that’s why I got them. If he can make them look good, so can I.” The pants go for $90, come in a ton of colors and patterns, and have cool names associated with them ”¦ what’s not to love? Thanks, Johnny. Lord knows, golf has never been known for loud pants, although Daly may be breaking new ground in that area, that’s for sure. So, I was lucky enough to attend both a practice round and the second rain-delayed first round of the U.S. Open last week, located in Bethpage, New York, a scant 10 miles from my home. Ya can’t bring a camera to the “real” golf, but they let you take pics at the practice round. Of course, Tiger plays at like 6:00 am, so by the time I got there, he’d finished up his practice round. Did catch him on the practice green though, where he flashed those Tiger whites after sinking a long one. After Buick went belly-up, Tiger is now sporting AT&T on the bag. They sold these huge giant golf balls in the merch tent. Why would you need a huge giant golf ball? The better to get autographs of course. Most of the players were pretty accommodating. This dude wanted to sign my camera. Actually, he was signing one of these flags, which were also apparently hot sellers. Moving on to the course, I followed Sergio Garcia for a few holes. If you weren’t aware who he has a clothing contract with, all you had to do was check out his belt loop. The Long Island crowds were actually pretty nice to him considering in 2002 he flipped him the bird. And check out that photo (first one in the article). Then compare it to this one (like so). Yeah…I’m in the wrong business. Angel Cabrera, the Masters Champion, was also on the course. What a nasty SOB. Didn’t smile, didn’t sign autographs, walked right by little kids with those big balls and flags. This was him teeing off on the 208 yard 17th. Nice swing. Douche bag. It’s a big course. In fact, it’s like 7,426 yards long, and I think I walked every foot of it. I actually used to play this course back in the early 1990’s. And yep, they had that sign back then. Greatest golf moment in my life came on this course, when I missed aceing the 8th by a foot. Caught Rory Sabbatini for a hole. While perhaps more famous for his ‘feud’ with Tiger (and why I personally believe he’s no longer with Nike), Rory now has Nerf as a sponsor. He’s also famous for some really crazy belt buckles, although when I saw him, he was much more reserved. Former Masters Champ Mike Weir was also on the course. He was pretty cool, getting into it with the crowd. Astute hockey fans, are we Long Islanders, even if we don’t have a professional team, and the fans good naturedly chided him with “how about them Penguins?” (Weir, a canadian, is a huge Wings fan). He’s cool (oh yeah, I already said that). There were like 900 merch tents scattered throughout the grounds, selling all kinds of stuff. Considering a hot dog was $6, a water was $3 and a brewski was $9, this was a relative bargain. New Era, are you paying attention??? Not sure why I took this picture, since I don’t recognize who’s teeing off, but if you notice the volunteers all have pink sweatbands, a nice gesture towards Phil Mickelson’s wife, Amy. Here’s another shot with those same volunteers, this time with boy wonder Rory McIlroy jacking a drive. It really was a beautiful course, with lots of deep rough. Lots of deep bunkers awaited errant shots, strategically protecting greens. All in all, a good day, as I went the only two days (practice rounds and actual tournament included) that didn’t have a drop of rain. Caught a few more notables, including two-time defending British Open Champ, and PGA Champ Paddy Harrington. Caught Brent Snedeker on the practice green, as well as former Masters’ champ Zach Johnson. Out on the range, caught former US Open champ Jim Furyk and Ryder Cupper Kenny Perry (who is taking what looks like an Al Czervik swing, but drilled that particular one about 300). Good times. Good times. Took about 350 photos, and I’m sure there are some I should have included besides these, but that’s what I uploaded. Only regret was not seeing Phil Mickelson during the practice round, because he didn’t arrive until the following day, but I made up for it on Friday, when I followed his group (which included Ernie Els and Retief Goosen) for about 9 holes. Guess The Game From The Scoreboard: I have a feeling I’ll never be able to stump you guys. But I’m going to try once again. There are clues on the scoreboard (shouldn’t have much trouble figuring out WHERE they’re playing this game). As always, please include the location, date and final score, all of which can be found by linking to Baseball Reference or Baseball Almanac. Good luck. Ready? Guess The Game. As always, if you guys have any scoreboards you’d like to submit for this game, drop me a line. Have a good Saturday, folks! There was some mention a few days ago about the boxy SOX logo on the 64 White Sox blue and 59 black and reds. The originals had the breaks in the lines on both the black and the Navy versions. There\’s plenty of pic\’s verifying both. Screwing around with my ToonBoom animation program last night, and drew the simple box-y logos out to show how the breaks in the letter is to create a interwoven 3-d effect, thus-ly: You can see the right part of the S is above the O, but the left part of the O is on top of the continuation of 5. Kind of a chain link pattern. The O is embroidered above the top left of the X, but that stroke of the X is still on top of the other stroke. I\’m fixing to hit the sack – but one more thing: Here\’s how the current hat logo would look with the 3-D breaks. subtle. I\’ll be up in time for the Sox game at 3, with the Cubs. May The Strokes be with you. Nice article. The “dude” that wanted to sign your camera was Ricky Barnes, who came in 2nd place. Did you know that or not? I’ve got the scoreboard answer also. I’m by no means a traditionalist when it comes to golf attire. I usually wear these when I play, so take this for what it’s worth, but I have to give Mr. Daly’s trousers a passing grade. I played more often, I might consider shelling out the $90 for a pair of those. One thing I was wondering, though. I always thought pro golfers were not allowed to wear shorts. Or are the rules different for qualifying? It’s actually Brandt Snedeker instead of Brent. Enjoyed the plethora of reading this morning. [quote comment=”337098″]I’m by no means a traditionalist when it comes to golf attire. I usually wear these when I play, so take this for what it’s worth, but I have to give Mr. Daly’s trousers a passing grade. I played more often, I might consider shelling out the $90 for a pair of those. As a former club pro also (and a guy who made it through both local and sectional qualifying for the US Open), I can tell you shorts are permitted for qualifying. They are precluded for the tournament itself. An odd thing about the Open. In most professional tour events, you miss the cut, you get nada. The USGA pays professionals $1000 (as of the mid-’90s) just for making the field. Someone correct me on this if need be, but I believe John Daly may be the only golfer left who does not normally wear some sort of headgear on the course. I do like Daly’s diamond-print pants. The others…not so much. 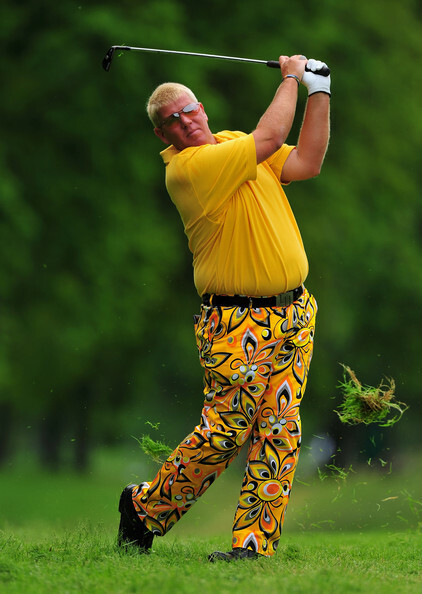 I’d prefer a crazy shirt over solid, but color-coordinating pants, instead of Daly’s crazy pants with tame shirts. But I am generally a fan of geometric patterns, and have no problem with these stylings for golf. This is why I need to consider getting up earlier on the weekends. This is the answer. Imagine that: the Cubs lost. Never realized the board at Wrigley became obsolete in 1977. Who (and what) decides what games aren’t posted? Also, why wouldn’t they post the A.L. home (interleague) games on the AMERICAN side? 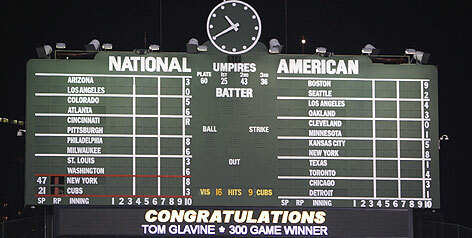 The scoreboard crew at Wrigley determines which games are included on the scoreboard every day. I’ve always thought they could tweak the board a bit to have a full line score for the Cub game, lineups for the Cub game, and abbreviated scores for every other game in the majors, with no loss of the old-school feel. John Daly has always been an interesting character on the PGA Tour, and with him showing some progress and success in this “comeback”, I am enjoying his latest wardrobe choices. The news to me is that he’s getting paid to do it. Good for him. Golf is about the individual, and he is certainly getting the publicity. Nice golf pictures. I’d love to go to a big tournament with all the stars there. I’ve only been to one Fall Series event, and the biggest star there was, yep, John Daly. [quote comment=”337107″]Never realized the board at Wrigley became obsolete in 1977. Who (and what) decides what games aren’t posted? Also, why wouldn’t they post the A.L. home (interleague) games on the AMERICAN side? [/quote]Don’t forget that they now have the ribbon boards for the extra games, plus with their day game-heavy schedule there’s not a huge impetus to post those last few West Coast night games. I’d imagine their rivals always get their games posted, and perhaps the AL West gets their games ignored when push comes to shove. [quote comment=”337108″]I used the …. to figure out which game it was…[/quote]I wonder if you could also tell by the flags? On the Loud Mouth golf site they have a page of customer photos, one of which is the cover of a GolfWorld issue whose lead story is “John Daly’s Last Chance?”. There is some irony there. FWIW I was a big fan of the guy for a long time. My son caddied for him in some pro-am events and he was gracious and funny. But you can only invest so much into a guy who gives such little back on the investment. I really hope that this comeback attempt actually works. Uni-related: I really enjoy the colorful look he’s bringing to a very staid sport. I wish I had the stones (and $$) to wear that stuff. Funny, I’m such a traditionalist when it comes to stuff like baseball unis. MLB Network is showing a replay of the 1986 NLCS, Game 5, and it appears that both teams are wearing their home whites(sorry no screengrabs). We’re all used to seeing color vs. color nowadays, but I’ve never seen white vs. white in MLB. This morning I was watching a replay of Kilkenny vs Galway in the Leinster provincial hurling semifinals as broadcast on Setanta (RTE in Ireland). At ~2:40 of the first half there’s a closeup of the Kilkenny goalie and he’s wearing a Chicago Bears hat! Not even a color match – Kilkenny is black/gold. I don’t have video capture capabilities and my YouTube-fu is definitely white belt – if someone out there wants to grab a still, go for it. [quote comment=”337119″]This morning I was watching a replay of Kilkenny vs Galway in the Leinster provincial hurling semifinals as broadcast on Setanta (RTE in Ireland). At ~2:40 of the first half there’s a closeup of the Kilkenny goalie and he’s wearing a Chicago Bears hat! Not even a color match – Kilkenny is black/gold. Joe Farrell and Tim Williams, the fake umps who frequent Blue Jays games, are back today. They’re sitting in the TD Banknorth “comfort seats” along the first base line instead of their traditional seats behind home plate. The Phillies announcers on the MyPhil17 broadcast did a bit about them in the third inning. They mentioned that they guys are stockbrokers by day. They also reiterated that the YES network has arranged for them to sit behind the plate in the new Yankee Stadium during an upcoming Jays-Yankees series. Maybe it’s the 4th of July weekend? The main announcer said he thought the guys calling balls and strikes behind the plate was “kind of annoying after a while,” which is also the general consensus of Blue Jays fans who Twitter, for what that’s worth. Eugene, OR — Today the University of Oregon athletic department made a bold move in the world of sporting apparel – even bolder than its unveiling of this year’s football uniforms. The university announced this will be the final year Nike is making its uniforms. Starting next season, the Ducks will wear creations from the drawing boards of Loud Mouth Golf. A date has not been set for the official unveiling of the Loud Mouth/Oregon football line of uniforms. [quote comment=”337121″]Joe Farrell and Tim Williams, the fake umps who frequent Blue Jays games, are back today. They’re sitting in the TD Banknorth “comfort seats” along the first base line instead of their traditional seats behind home plate. The Astros gray in those days wasn’t a very dark gray, but they certainly weren’t white uniforms. The Islanders, Oilers, and Flyers were the only teams that gave third sweaters to their draft picks; I’ve heard rumors of all three of those clubs going back to those old looks in their primary uniforms next year and this points in that direction. Matt Vasgersian no longer announces Padres games…I believe he is now a studio host for the MLB network. If that 1984-85 preseason only info is correct, then Mario never wore that jersey in a REGULAR SEASON game. funny, because that’s a pretty popular jersey at the arena, and if I was to buy a jersey that would probably be it. They wore yellow helmets with both the white and yellow jerseys right? I think when Sports Illustrated ran its first Mario article, there were photos of him the yellow jersey, like the inset here. I can’t find the one I remember on Mt. Washington. They did wear gold helmets at home with white jerseys; IIRC, that continued even after they discontinued the alternate jerseys. I think loud works very well for golf pants and only wish that I had the game you’d need to wear these. 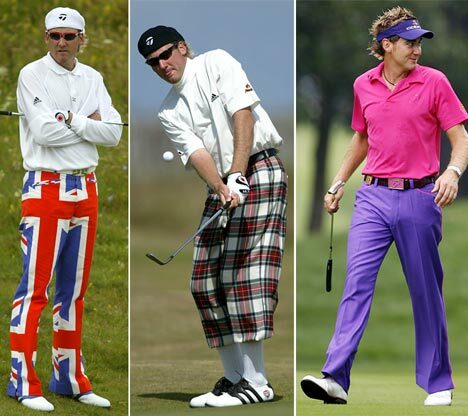 Now what about LoudMouth plus-fours? I bet Payne Stewart — who happily wore the garish NFL stuff — would have rocked them. It was nice to see a stirrup v. stirrup pitching matchup in today’s Sox-Cubs game, as DJ Carrasco for the Sox pitched an inning of relief, followed by Aaron Heilman for the Cubs. This thing is really catching on, and I can’t wait to see Bobby Cox in ’em. From 1984-85 thru 1987-88, the Pens wore gold lids with the white jerseys. And before that, tOSU will pick up royal blue and kelly green. Dang, the Rangers should have produced a red and blue 50-50 jersey kind of like that to go with the two-tone helmets. Would have been so comically bad, but it would have been hilarious. 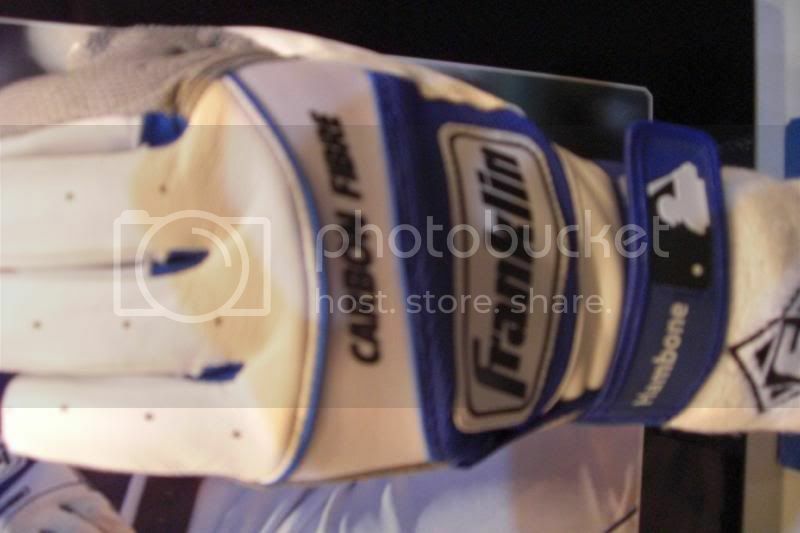 As for Hambone, he has that nickname on his batting gloves. I got to see them (not him) at last year’s All Star Fan Fest. It’s so weird seeing the “Gigantes” unis in road gray, even if the Brewers are wearing their Cerveceros. Any one know if that’s the first time it’s been worn in gray? I’m embarrassed about my post earlier today. I tried to make a Strokes (the band) joke/reference, since I used the word a bunch of times. When I saw it posted with all the \\\\’s – don’t know how I managed that – well, in Chicago, you’d say I looked like a jag—. I apologize. I promise not to post before noon. I’m worthless most mornings. To regain my credibility, I offer my computer drawn,Wrigley scoreboard evolution. [quote comment=”337140″]I’m embarrassed about my post earlier today. I tried to make a Strokes (the band) joke/reference, since I used the word a bunch of times. When I saw it posted with all the \\\\’s – don’t know how I managed that – well, in Chicago, you’d say I looked like a jag—. I apologize. I promise not to post before noon. I’m worthless most mornings. Nice, but I’ve got something to nitpick. The White Sox aren’t listed as “SOX” on the scoreboard. They’re “CHICAGO”. I remember when I was a kid, they were listed as “WHITE SOX” (or possibly “SOX”, I really can’t remember but it definitely wasn’t “CHICAGO”) and their score had the red horizontal dividing lines like the Cubs score has. I think they changed that policy around the time the Tribune took over. One thing I just noticed on that guess the scoreboard picture — for interleague games, the Mets and Yankees are “N.Y. (NL)” and “N.Y. (AL)”, respectively. That’s not the case for regular games, as can be seen here (BTW, I was at that game). Apparently the Angels and Dodgers don’t get the same treatment (or at least they didn’t in 2006) because for the Angels/Padres game on that scoreboard, the Angels are just “LOS ANGELES”. Ooooops. That second link should have been this picture. I don’t know if those unis were even technically gray. They were off-white, for all intents and purposes. I know these Okkonen/DTTN pics aren’t always spot-on, but this is a pretty accurate rendering, if memory serves. Yes, they’ve used both SOX and CHICAGO for the White Sox. I haven’t seen it highlighted like the Cubs, but I don’t doubt it. I’ve seen the Cubs highlighted in blue, both Chicago games at the top, bottom, and for a long time, slightly lower than half way up. I’ve been searching for as many photos of the SB as I can online. Here’s one with SOX, when the Chicago games were at top, after the pre-season Cub-Sox exhibition game, and WHILE they’re expanding the number of games from four to five on the AL side. It’s dated April 61, and may have been posted here before. I just think it’s cool. Just for yuks, here’s the next and truly last expansion. Anyone want to repaint the thing? Have fun while repainting it? OK, you were right it was simply SOX. Here are a few good photos. Supposedly from 1963 — both Chicago teams in the middle of the board, both with red dividers. circa 1987 (and here’s another, looks to be from the same game) — Chicago teams are now at the bottom/SOX and the red dividers are still there. Looks like 1988 was the switch to the white dividers for the South Side team, because here’s a shot from the fist night game in 1988. Looks like it might have still said “SOX” though. Since I apparently have nothing better to do, what say we have a look at those Astros road unis? Those things were not gray. To me, they look about the same color as the Giants’ home unis or the Phillies’ & Indians’ alts. Possibly even lighter. And remember these jackets? Sorry, Yogi. Oh, man, this is even better than the grounds crew in space suits. The Sox did the same (kind of) on their old scoreboards. CHICAGO for both they and the Cubs (as CHIGO) on the green 50’s SB, changing to SOX, then WHITE SOX by 59. I thought I saw CUBS in one of the green sb pics, but can’t find it. Most are pretty blurry. Cubs are usually CHIGO on the fireworks SB, but here’s a mid 70’s shot with CUBS, and not at bottom-center. which show a blank screen. Don’t know what it is, just can’t view them. I know it’s late, but yes, it is the first time. What was weird wasn’t seeing “Gigantes” on the road uniform as much as it was seeing the font used on the home jerseys on the grays. The roads normally have more of a standard block lettering while the homes have the more stylized font. If you happen to read this, sometimes with those Getty Images links, you just have to highlight the address in your browser’s address bar and then hit enter, or sometimes you need to put a space at the end and hit enter (or hit the GO button or whatever) and then the picture will show up. I don\’t know if those unis were even technically gray. They were off-white, for all intents and purposes. They were a cream-ish color. Certainly not white, but lighter than traditional gray. I didn’t see this mentioned in the comments yesterday… The Brew Crew wore their Cerveceros unis last night, but for the first time they combined them with their blue alts. Every other time they have done this promotion (I think four times or so) they have always been on the white unis. Yuck, I was at that Cubs/Tigers game. After a couple years of moderate success and then that season turning into a debacle, it was one hostile crowd that day. My fellow Cub fan friend even joined in a couple “Let’s Go Tigers” chants. I remind him of this at times. The Tiger fans owned Wrigely that day. I have a DVD of a Cubs/Padres game in August of 1987 in which Harry Caray has some comments regarding some changes made to the scoreboard during the most recent road trip. They even showed a before and after, but I really couldn’t tell the difference. Harry was saying it was “easier to read”. I believe they may have just painted vertical divider lines between every three innings. Or possibly just the fresher paint made it easier. I dunno. Good Day. To try to be better is to be better. Help me! Help to find sites on the: Free printable kid cards. I found only this – business hours for kia west island. Learn about commercial mortgage loans in the mortgage calculator. Credit tip! Education loans are also sanctioned by colleges, universities, kill bad credit phobia, take bad credit secured personal loan. Thank you very much :mad:. Jafit from Brazil. I have recommended a very good website. ReplicaBestHandbag.com online store have many high quality handbags,fake bags,purses,cheapest,wholesale handbags,Louis Vuitton,CHLOE,Gucci,Chanel,hermes,Coach,Prada,Miu Miu,Mulberry,Marc Jacobs,Dior,Fendi,Balenciaga,Thomas Wylde,Jimmy Choo,Burberry,Dolce & Gabbana,D&G,handbags, bags. Free shipping for all. More then 30% discount. 40% cheaper then the market. But we made the best goods. Good evening. Thank you, so-so. Help me! Please help find sites for: . I found only this – . Michael is an exceptional executive with a long track record of value creation in financial services, and we look forward to collaborating with him to. Custom investment solutions for individual and institutional investors since. With best wishes :mad:, Clarke from Croatia.